Anyway, as I said, the screen is e-ink - so you're only getting black and white. But you're also getting absolutely ridiculous battery life: B&N claims 2 months on a single charge with Wi-Fi turned off. Seems like Amazon's Kindle might finally have some legit competition. 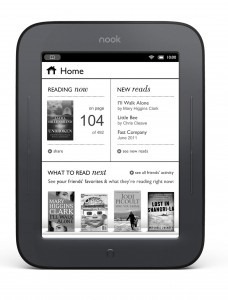 As far as improvements over the NOOK originale are concerned, they're numerous. It's lighter, thinner, faster, has 50% better display contrast, an IR touch screen, hugely improved battery life, more internal storage (2GB), and much-improved page-flipping animations. Nifty. 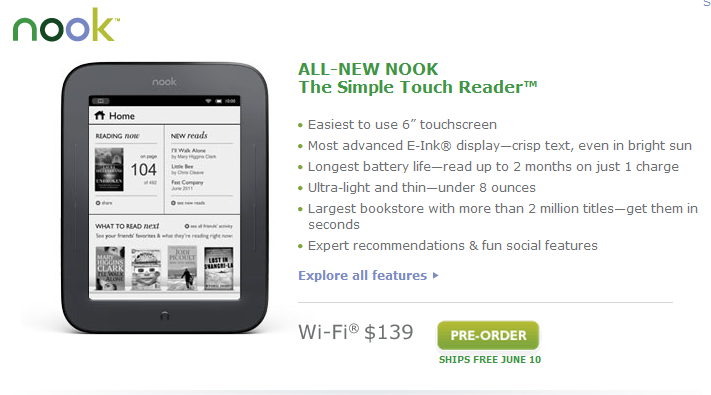 NEW YORK–(BUSINESS WIRE)– Barnes & Noble, Inc. (NYSE: BKS), the world’s largest bookseller, today expanded its bestselling digital reading offering with the All-New NOOK, The Simple Touch Reader. With a full touchscreen, NOOK™ features record-setting, extra-long battery life on the easiest-to-use, ultra-light, portable 6-inch eReader with the most-advanced E Ink Pearl display, and the world’s largest bookstore available by Wi-Fi®. Now available for pre-order at www.nook.com and at Barnes & Noble stores for just $139, NOOK will begin shipping on or about June 10. Barnes & Noble adds the All-New NOOK, a significant leap forward in the dedicated eReader category, to a product line that includes the bestselling NOOK Color™, the only Reader’s Tablet™. Based on the success of the NOOK product line, combined with focus on the absolute best reading experience, Barnes & Noble now claims more than 25 percent of the digital book market - just 18 months after launching NOOK 1st Edition™. At only 7.48 ounces (212 grams), the artfully designed All-New NOOK is lightweight and thin - 35 percent lighter and 15 percent thinner than NOOK Wi-Fi 1st Edition™. Lighter than a paperback, NOOK’s sleek but durable, compact design (6.5 inches high by 5 inches wide by 0.47 inches deep) makes it easy to fit in a jacket, pocket, purse or backpack, holding up to 1,000 digital books and more personal content using the expandable memory slot. Its ergonomic, contoured design with a soft-touch back makes it easy and comfortable to read, even with just one hand, and for extended periods of time. And thanks to best-in-class battery life, read for up to 2 months on a single charge with Wi-Fi off - that’s twice as long as the other leading eReader available. Barnes & Noble’s use of the latest-generation E Ink screen and proprietary technology offers unmatched performance on the All-New NOOK, delivering a seamless and immersive reading experience. NOOK offers 80 percent less flashing than other eReaders - whether turning pages, browsing for books or scrolling through your library. Page turns are lightning fast, using the touchscreen or well-placed side buttons, and with the new Fast Page™ feature, just press and hold a side button to quickly scan through content and skip right to the desired section. "We set out to design the easiest-to-use, most optimized, dedicated reading device ever created and accomplished it with the All-New NOOK," said William Lynch, Chief Executive Officer of Barnes & Noble. "Touch makes it simple to use, and the beautifully compact design makes it the most portable eReader in its class. Add to that an unmatched battery life, the most advanced paper-like touch display on the market and wireless access to the world’s largest digital bookstore, and we believe that for readers of all ages, the All-New NOOK is the best eReader on the market, and a great value at $139." Another way NOOK customers can learn more about great books is through NOOK Friends, an exciting social experience previously available only to NOOK Color customers. From the home page, customers can see book recommendations from friends. See what your friends have posted about their current read, swap recommendations, share reading status, favorite quotes, and much more. Through Twitter® and Facebook® integrations, right from their current book, customers can tweet the title they’re reading, post on their Facebook wall and see what their NOOK Friends "like" on Facebook. With Barnes & Noble’s exclusive LendMe® technology, you can also lend eligible books to your friends at no cost for 14 days, and see and request to borrow friends’ LendMe books.